Creativity is all about exploring new things, testing the boundaries, which is what we did in our newest issue of ModBlock. You'll see in our latest modern projects and articles how we've studied the concepts of scale, how combining big and small turns your project into something completely new. We also explored the essence of color, how it inspires us and our creativity. But it's not just fun with scale and color this unique issue has in store for you, you'll be introduced to a brand new, cutting-edge tool that we think you'll be just as excited about as we are. We hope these projects inspire you to try new things, and we hope you love this issue of ModBlock as much as we loved making it. Enjoy! 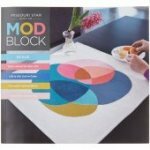 This special issue of ModBlock includes a large template insert!